From the back cover: Featured with the Goodman orchestra was another great name of American jazz whose reputation abroad is as big as his build – "Mr. Five-by-Five" himself, the original Jimmy Rushing. Like BG, Jimmy is a legend in his time, one of the few remaining authentic blues singers, whose career spans the great cities of American jazz – New Orleans, Chicago, Kansas City and New York. He's been up there now for nearly a quarter of a century, and, of course, first established his international reputation with the Count Basie Band, with which he spent fifteen years. His most recent award was his selection as "Best Male Jazz Singer" in the 1958 Down Beat International Critics' Poll. 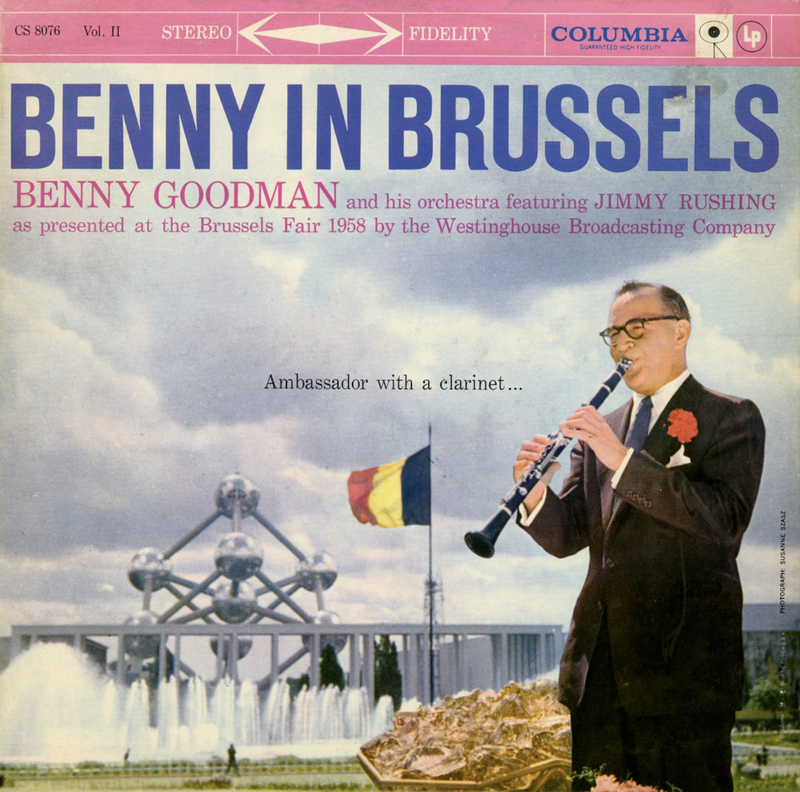 The Benny Goodman orchestra which scored so big at the Fair, includes some familiar names, some young, some older, but all of them of the familiar BG calibre. Among them are Arvell Shaw on bass; Zoot Sims, tenor sax; Rex Peer, trombone; Roland Hanna, piano. The roster also numbers a veteran of the 1938 Goodman band, trombonist Vernon Brown. Other members of this outfit are Gene Allen, baritone sax; Billy Bauer, guitar; Al Block, alto sax; Willie Dennis, trombone; John Frosk, trumpet; Billy Hodges, trumpet; Ernie Mauro, alto sax; E. V. Perry, trumpet; Seldon Powell, tenor sax. As in every Goodman organization, there's a BG discovery; again Benny proves his talent for picking talent in the person of pianist Hanna, twenty-six year old Detroit musician, whose big-time debut this is For Hanna, the tour with Benny represented not only discovery and success but, at the last moment, something of a problem. Seems that Hanna, who is a student of classical music at the Juilliard School, found himself in a dilemma when the week in Brussels reached its end; he was due back in New York Monday morning for his final exams at Juilliard, and because of the tourist rush he couldn't get the plane connections to get him back in time. So Benny made a trans-Atlantic call to the Juilliard dean and talked him into a two-day extension for Hanna. Result: Rollan took his exams, passed high.